address: 43 Market St, Tottington, Bury, BL8 4AA. North of Manchester lies Bury and North of Bury is Tottington. 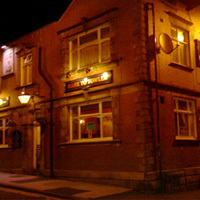 In this semi-rural hinterland between the city and Rossendale is an out-post - the last bastian of rock before you hit a world of farmland and folk music - It's name ; the Hart To Towler - the venue is becoming a bit of a legend with a staple of heavy rock, tributes and touring bands - there's a lot for everyone. Whilst there's sympathy for the dress code (see below) the strict age policy makes it out of bounds for young rock fans, but lets all convince the landlord to put on a few up and coming young bands for the Totty massive....! ALL MEN (& WOMEN) MUST KEEP TO THE CODE OR FACE WALKING THE PLANK HAHAHA ! ....don't turn up in chav gear. It says no caps etc on the door - if you ignore it & walk in regardless, you just won't get served. "It's not your kinda place pal.."
sound:tbc - :: layout: a pub:::lights: tbc: :: beer:pub selection - draught (of course !) + bottles !